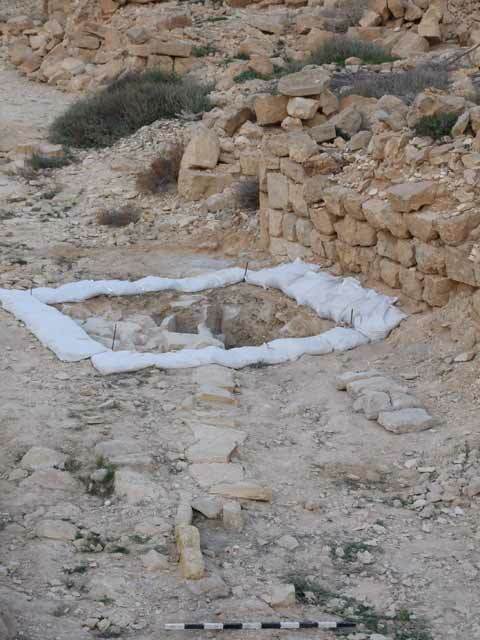 In October 2015 – March 2016, an excavation was conducted at Shivta (Permit Nos. G87/2015, G4/2016; map ref. 16400–555/53100–450) as part of a research project on the decline of the Negev’s Byzantine settlements. 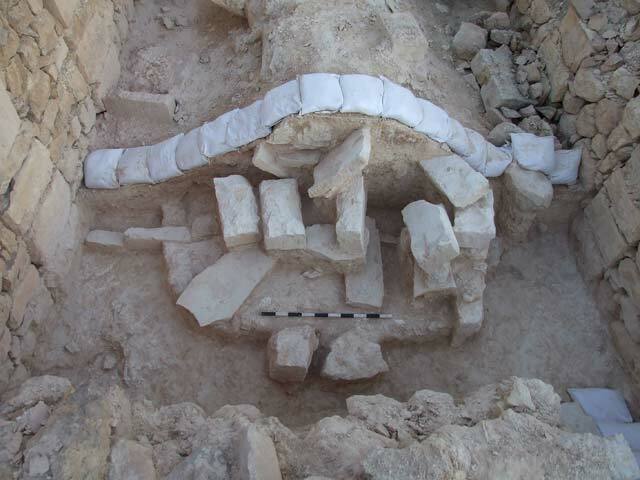 The excavation, undertaken on behalf of the Zinman Institute of Archaeology of the University of Haifa and funded by the European Research Foundation, was directed by Y. Tepper (photography), G. Bar-Oz and L. Weissbord (bioarchaeology), with the assistance of A. Levi, A. As‘ad, Y. Sfez, R. Belvis, G. Shalvi, H. Shochat, O. Dafni, Y. Hadar and S. Tepper (area supervisors), N. and N. Bar-Oz (administration), A. Blumenkranz (surveying), S. Pirsky (plan), C. Ben-Ari (GPS), T. Erickson-Gini (pottery), Y. Gorin-Rosen (glass), N. Marom (archaeozoology), Y. Farhi (numismatics), L. Di Segni (epigraphy), R. Khamissa (rock engravings), E. Maayan-Fanar (Byzantine art), O. Shamir and N. Sukenik (textiles), D. Fuks and E. Weiss (botany), D. Langgut (pollen), I. Ktalav (mollusks), R. Linn (plaster and petrography), M. Meiri and G. Patsau (palaeogenetics), R. Shachak-Gross and Z. Dunseth (geoarchaeology), N. Porat (OSL), E. Boaretto (radiocarbon), K. Modena, A. Salomon and M. Cohen (seismology), R. Shafir (conservation), A. Gissis (drafting) and S. Ad (finds drawing), as well as A. and D. Oach, A. Biton, T. Tsuk, O. Brotnik, Y. Israel, Y. Haimi and P. Betzer. 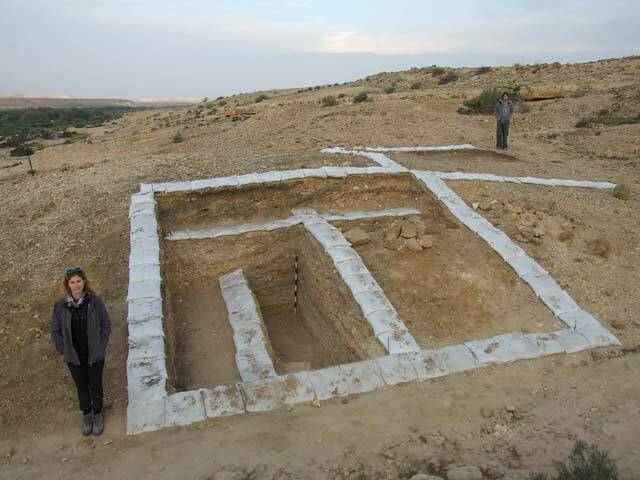 The site of Shivta (c. 90 dunams; 350 m asl) is located in a semi-arid region c. 40 km south of Be’er Sheva‘, on a limestone ridge above the north bank of Nahal Zitan. Excavations carried out by the Colt Expedition in 1933–1936, 1938 uncovered a settlement with dozens of domestic structures and alleyways. In the center of the settlement are two reservoirs (northern and southern), a mosque and a church (the Southern Church), and there are two more churches in its northern part (the Middle Church and the Northern Church; Baly 1935; Crowfoot 1936). The settlement is mentioned in the sixth-century CE Nizzana documents. It was apparently built in the second century CE, reached its zenith in the Byzantine period, and was abandoned at the start of the Early Islamic period (Segal 1985; Hirschfeld 2003; Erickson-Gini 2013; Tepper and Bar-Oz 2016; Tepper et al. 2018). Twenty squares (A–T) were excavated within the settlement and on its outskirts, yielding remains from four periods were unearthed: the Roman period (second century CE; Area P), the Byzantine period (fifth–seventh centuries CE; all areas) and the Early Islamic period (seventh–eighth centuries CE; Areas E, G, K), as well as modern waste dump (Area N). Area A. A small probe excavated down to bedrock (depth 0.45 m; Fig. 1) under the stone floor between two rows of columns in the southern part of the mosque revealed three layers of bedding beneath the floor. A coin from the Roman period and a few Byzantine potsherds were recovered from the upper layer. Area B. To the east of the mosque, two trial squares were opened in an alley that was in use during the Byzantine period but was rendered obsolete when the mosque’s eastern wall was built in the Early Islamic period. One square excavated beside the mosque wall yielded layers of collapse and loess deposits, attesting to a period of abandonment. Excavating beneath them, down to bedrock, revealed a series of Byzantine-period tamped-earth floors installed over layers of bedding. The second square, opened further up the alley, yielded a Byzantine floor. Area C. A square opened in a large dwelling complex facing the courtyard of the mosque was only partially excavated due to technical considerations. Area D. A probe was excavated down to bedrock in the corner of a room in a building with a walled-up entrance (Fig. 2). The upper layer yielded numerous building stones, including voussoirs and large stone slabs that had served as roofing. Loess soil deposited after the building collapsed was uncovered between the stones. Fragments of sixth–seventh-century CE lamps were found above the floor of the building. Bedding material containing potsherds and coins from the Byzantine period (no earlier than the fifth century CE) was unearthed beneath the floor. Area E. A square was excavated in a midden deposited in an abandoned building (Fig. 3) to the northwest of the northern reservoir. The midden contained ash that was uniformly gray, along with rich finds, including pottery from the Umayyad period (seventh–eighth centuries CE), glass, remnants of textiles, animal bones, animal dung and botanical finds—mainly of date and olive pits and barley and wheat seeds. The floor of the building was made of tamped earth, and a few collapsed stones were found above it. Layers rich in animal bones (goat/lamb and pig) and in organic matter and seeds (vines, olives, wheat and barley) were found within the matrix of the floor and beneath it. These layers also yielded pottery and coins from the Byzantine period (sixth–seventh centuries CE). Area F. A lintel found in secondary use as a step (Fig. 4) was uncovered near an entrance to a domestic structure (the Pool House). The upper part of the lintel bears three worn rosettes(?) with ‘The Atrium(?) of the Sacred Church’ inscribed above them in Greek. The inscription was painted in red and flanked by a crosson either side. Two flat, smoothed stones that served as additional steps were placed beside the lintel. Bedding unearthed beneath the steps and down to the bedrock contained a few finds from the Byzantine period (sixth–seventh centuries CE). Area G. In the southern room of the Pool House, which was used as a stable and contained two troughs, a probe was excavated beside the eastern trough. The soil in the upper part of the probe yielded mixed finds from the Byzantine and Early Islamic periods, along with modern finds (Fig. 5). Beneath it was a collapse overlaying a layer of soil rich in organic material and dated to the Umayyad period (seventh–eighth centuries CE), which reached down to bedrock. Area H. Four squares were excavated, one in the northern reservoir (H1) and three in the southern reservoir (H2–H4). The northern reservoir’s floor was uncovered in Square H1 (depth 3 m), opened along its southern wall. The floor, which was made of gray plaster and sloped northward, was installed over two levels of small stones placed on the bedrock. The floor was covered by a layer of soil (thickness 0.5 m) devoid of stones and composed of thin layers of light brown silt, which were deposited while the reservoir was still in use (Fig. 6). The floor of the southern reservoir was uncovered in Sq H2 (depth 2.5 m) dug beside its northern wall. A layer of plaster was discovered on the floor, which sloped gradually to the southwest, and beneath it were two layers of small stones arranged over the bedrock and bonded together with gray mortar. The upper layers of the squares contained modern finds; Byzantine-period finds (fifth–seventh centuries CE) were recovered from above the reservoir floors and beneath them. Area I. A square was excavated in an abandoned dwelling near Area E, seeking to determine if the building was deserted because of an earthquake. The floor was covered with a layer of loess soil overlain with collapsed building stones, including the stones of an entire arch and stone slabs from the ceiling (Fig. 7). These indicate that the building was abandoned prior to its collapse. Numerous fragments of pottery and glass from the Byzantine period (no earlier than the fifth century CE) were found beneath the floor and as deep as the bedrock surface. A small hoard of coins discovered in the bedding of the floordates from no later than the mid-sixth century CE. Area J. Northwest of the northern reservoir, a square was excavated in a dwelling with a walled-up entrance. Numerous building stones were discovered in the layers between the surface and the building’s floor. Above the floor were strewn large stone slabs, stone beams that held the roof and voussoirs (Fig. 8). The supporting pier of an arch was identified in the eastern section of the square. A few Byzantine potsherds were found on the floor. An oven was unearthed next to the northern section of the square. Tamped earth discovered between the floor and the bedrock contained a few finds that dated the building’s construction to no earlier than the fifth century CE. 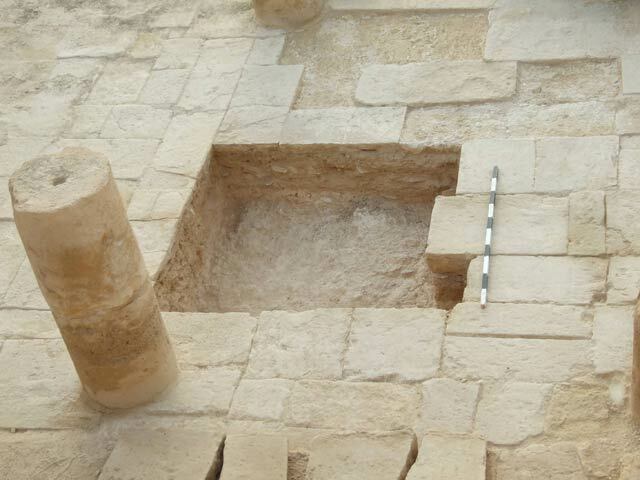 Area K. Two squares (K1, K2) were excavated in a midden in a building that had been abandoned to the northeast of the mosque and the Southern Church. Square K1 was opened in the building’s eastern room, where a uniformly gray midden unearthed above the floor was rich with botanical finds, mostly nuts, pomegranates, olives, dates, wheat and barley. The midden also contained zoological finds (goat/sheep and fish) and pottery and glass fragments from the early Umayyad period (seventh–eighth centuries CE). The floor uncovered beneath the midden was made of tamped earth and was strewn with a stones and mortar that collapsed from the walls. Pottery from the Byzantine period (no earlier than the fifth century CE) was unearthed beneath the floor. A walled-up entrance (Fig. 9) was uncovered in the room’s western wall, which separated it from the western room, where Sq K2 was opened. A cooking or baking installation containing numerous burnt pebbles was unearthed at the top of the midden inside the room. This midden contained similar finds to those from the midden in the eastern room. An installation constructed of medium-sized stones and mud was uncovered on the floor in the corner. It contained traces of charcoal, bones and countless fish scales. Finds from the Byzantine period (no earlier than the fifth century CE) were recovered from beneath the floor. Area L yielded a drainage channel that carried sewage from residential buildings out of the settlement (Fig. 10). The channel was stone-built and covered with stone slabs; a stone floor found alongside it was laid over a bedding of tamped earth. Layers of soil, stones and ash unearthed beneath the floor contained Byzantine pottery (no earlier than the fifth century CE). Animal bones, fish scales and eggshells were found in the soil deposited inside the channel. Area M. Two squares were excavated in a midden on the outskirts of the settlement (Fig. 11). In the northern square, where only the surface layer was excavated, Byzantine pottery and coins (sixth–early seventh centuries CE) were recovered along with a few shards of twentieth-century CE Black Gaza Ware. A small probe excavated from the surface down to bedrock in the southern square revealed sloping layers of soil, ash, and quarrying and masonry debris, as well as construction debris. 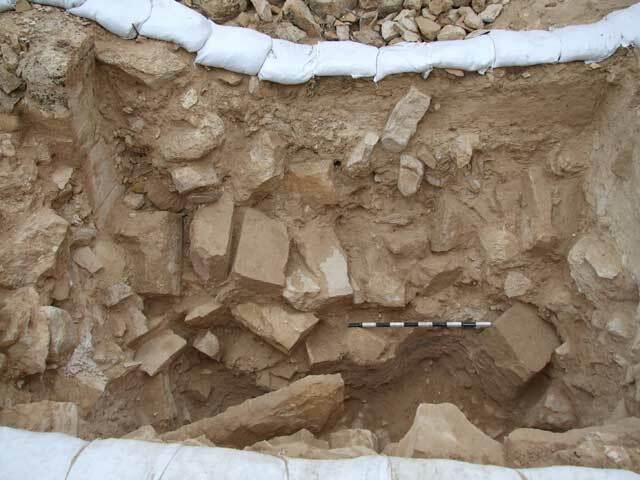 The layers of ash contained animal bones, botanical finds—nuts, olives, dates, vines, wheat and barley—textiles and fragments of Byzantine-period pottery and glass from the fifth–sixth centuries CE. Area N. A small probe was excavated in a waste dump on the outskirts of the settlement, southeast of Area M. The paucity of archaeological finds and the presence of modern finds indicate that the dump was formed in the last century, most probably during the Colt Expedition’s exploration of the site. Area O. 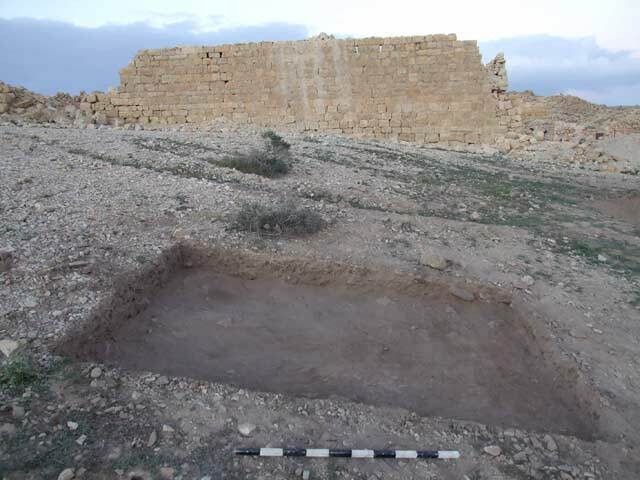 A small probe opened in a midden near the Nahal Zitan streambed exposed layers of construction and quarrying debris and mud-bricks, interspersed with several layers of ash containing finds from the sixth–seventh centuries CE. Area P. A square excavated from the surface down to bedrock in a midden near Area M (Fig. 12) unearthed animal bones, botanical finds and pottery from the Roman period (second–third centuries CE), including Nabatean and Eastern Terra Sigillata ware. Area Q. A square was excavated beside a wall (width 0.2–0.3 m) delimiting the site to the east, near a channel built to carry sewage out of the settlement. The square yielded a few artifacts from the Byzantine period (none earlier than the fifth century CE). 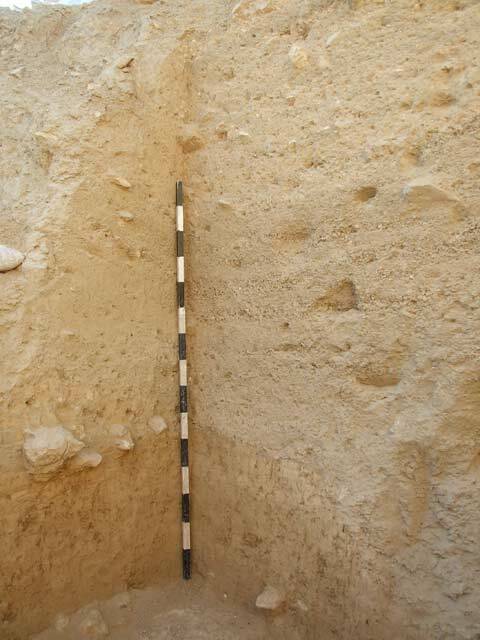 Area R. A section dug in a columbarium to the southwest of Shivta (Hirschfeld and Tepper 2006:86–94) uncovered its enclosingwall (width 1 m). The outer face of the wall was built of stones, whereas its inner face—of mud-bricks.The interior of the columbarium yielded dove bones, clay pipes and a few Byzantine potsherds (none later than the sixth century CE). Area S. Two squares were excavated in the southern and central aisles of the Southern Church. The bedding beneath the floor yielded remains from the Byzantine period (fifth–seventh centuries CE). Area T. A small probe was dug in the floor of an alley, beside the retaining walls of domestic structures and a walled-up entrance of a building in Area J. Two floors were unearthed; they abutted and post-dated a retaining wall. An earlier floor found beneath them was laid directly on the bedrock. The recovered finds date from the Byzantine period (sixth–seventh centuries CE). 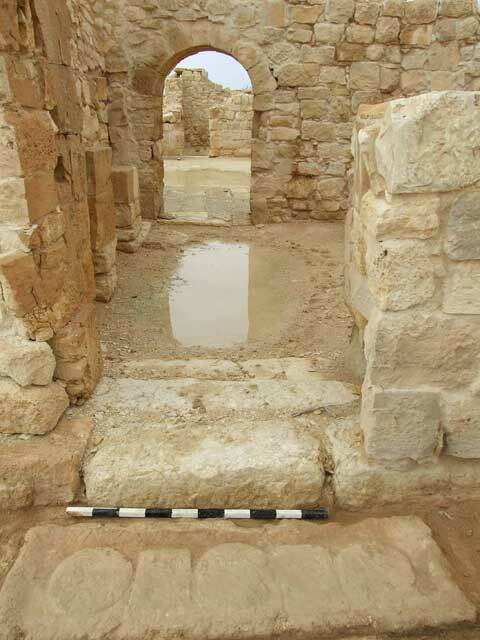 The finds from the midden in Area P indicate that the settlement of Shivta was founded in the Roman period (second–third centuries CE). Most of the finds at the site date from the Byzantine period (fifth–early seventh centuries CE), and it would therefore appear that the settlement grew and flourished in this era. Byzantine-period finds from the middens excavated outside the settlement indicate that at the time, the town’s refuse was removed in an organized and communal manner; the organic waste may have been used to fertilize the flourishing agricultural plots. 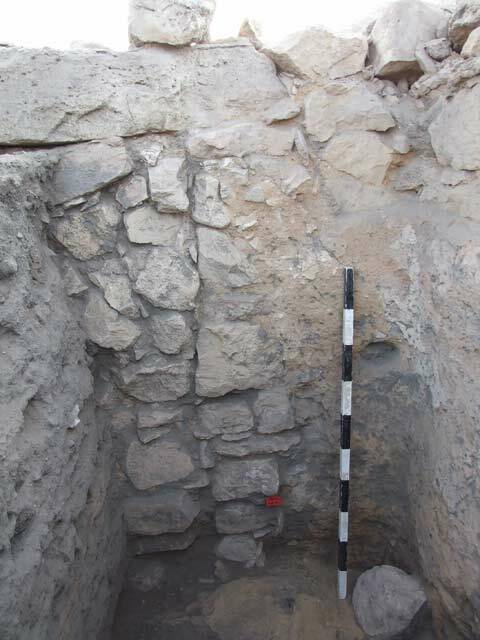 There are signs of the settlement’s abandonment prior to the seventh century CE: houses were deserted, and some had their main entrances were walled up (Tepper, Weissbord and Bar-Oz 2015). In some of the houses, the roof probably collapsed in an earthquake that occurred following the abandonment; its exact date and magnitude are unknown. 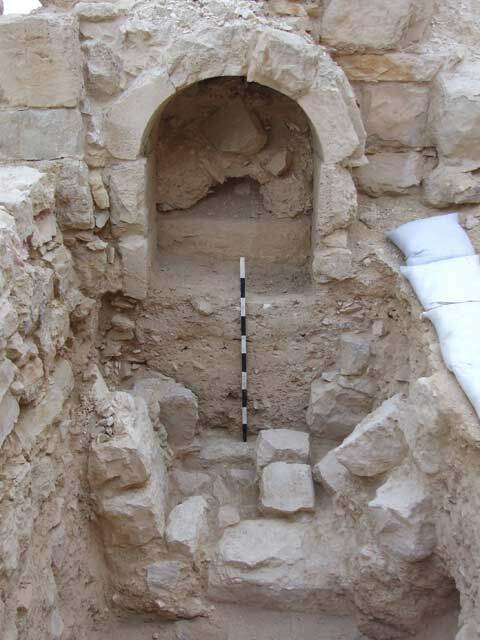 Middens that accumulated inside abandoned houses within the settlement yielded finds from the Umayyad period (no later than the eighth century CE). These indicate that by this time, organized refuse removal from the settlement had ceased, as well as the use of organic waste to fertilize the fields. Also, the number of inhabited houses probably decreased significantly in a process that began in the sixth century CE and was intensified in the early Umayyad period. It is therefore apparent that there was a change in the extent, organization and management of the settlement in the Umayyad period. The lintel bearing the inscription and crosses, which was a step in secondary use, indicates that the residents adopted a different religion and were no longer Christian. The mosque was dated in the past to the eighth century CE, and it was claimed to have functioned at the same time as the nearby Southern Church (Moor 2013). However, a reexamination of the evidence revealed extensive secondary use of architectural elements, some embellished with crosses, which may have come from the destroyed church. Furthermore, during the construction of the mosque, entrances were blocked and a nearby alley was rendered obsolete. Therefore, it seems that the Southern Church and the mosque were not used contemporaneously, and that the mosque was built only after the church was destroyed or abandoned. This points to the likelihood of a settlement gap between the end of the Byzantine period and the beginning of the Islamic period, when the Christian population was replaced by Muslims. The settlement was finally abandoned in the late eighth or early ninth century CE, and was never resettled. Baly C. 1935. Sʻbaita. PEFQSt 67:171–181. Crowfoot G.M. 1936. The Nabatean Ware of S’batia. PEFQSt 68:14–27. Erickson-Gini T. 2013. Shivta. HA-ESI 125. Hirschfeld Y. 2003. Social Aspects of the Late-Antique Village of Shivta. JRA 16:395–408. Hirschfeld Y. and Tepper Y. 2006. Columbarium Towers and Other Structures in the Environs of Shivta. Tel Aviv 33:83–116. Moor B. 2013. Mosque and Church: Arabic Inscriptions at Shivta in the Early Islamic Period. Jerusalem Studies in Arabic and Islam 40:73–141. Segal A. 1985. Shivta—A Byzantine Town in the Negev Desert. Journal of the Society of Architectural Historians 44:317–328. Tepper Y. and Bar-Oz G. 2016. Shivta. HA-ESI 128. Tepper Y., Erickson-Gini T., Farhi Y. and Bar-Oz G. 2018. 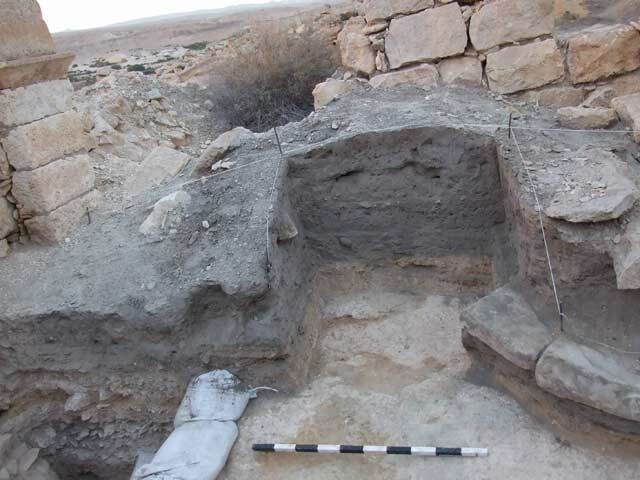 Probing the Byzantine/Early Islamic Transition in the Negev: Shivta in Light of the Renewed Excavations, 2015–2016. Tel Aviv 45:55–87. Tepper Y., Weissbord L. and Bar-Oz G. 2015. 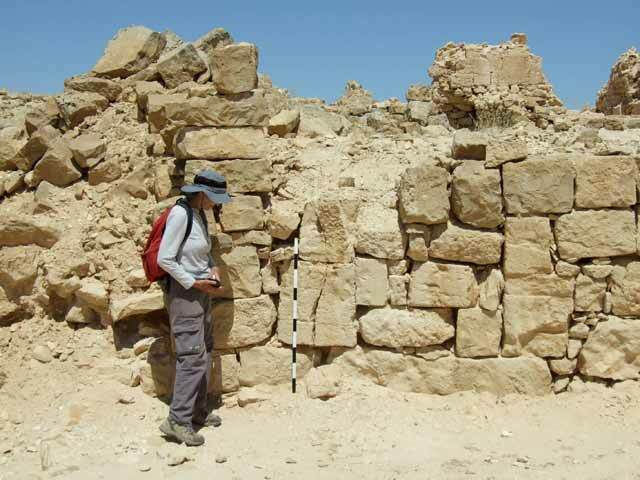 Behind Sealed Doors: Unravelling Abandonment Dynamics at the Byzantine Site of Shivta in the Negev Desert. Antiquity Project Gallery 348. 1. Probe under the mosque’s floor, looking southwest. 2. Building with walled-up entrance, looking north. 3. Midden in abandoned building, looking west. 4. Lintel in secondary use as a step, looking north. 5. The excavation near the trough in the Pool House, looking south. 6. Silt deposits in the reservoir, looking northwest. 7. Arch and stone slabs from a collapsed roof, looking southeast. 8. Collapsed building stones, roof beams and arch sections, looking south. 9. Partition wall and walled-up entrance, looking west. 10. Drainage channel, looking northeast. 11. Probes in a midden in Area M, looking north. 12. Probe in a midden in Area P, looking northeast.